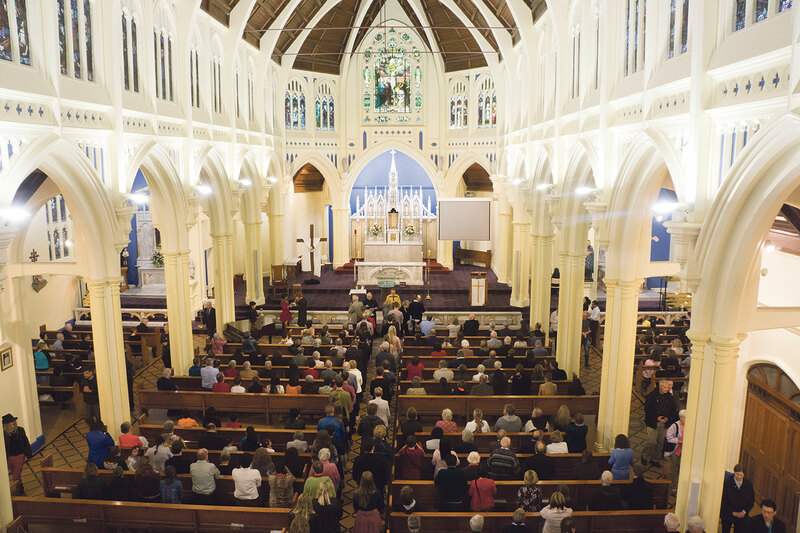 Wellington’s St Mary of the Angels Church was officially reopened on Wednesday 12 April in time for the greatest week of the Church’s year – the passion, death, and resurrection of Jesus. 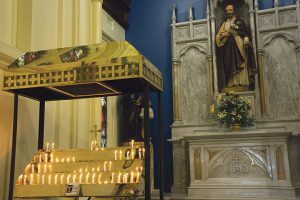 For almost 100 years the church has been at the heart of Wellington as a favourite place to visit for quiet contemplation, Reconciliation and Mass. 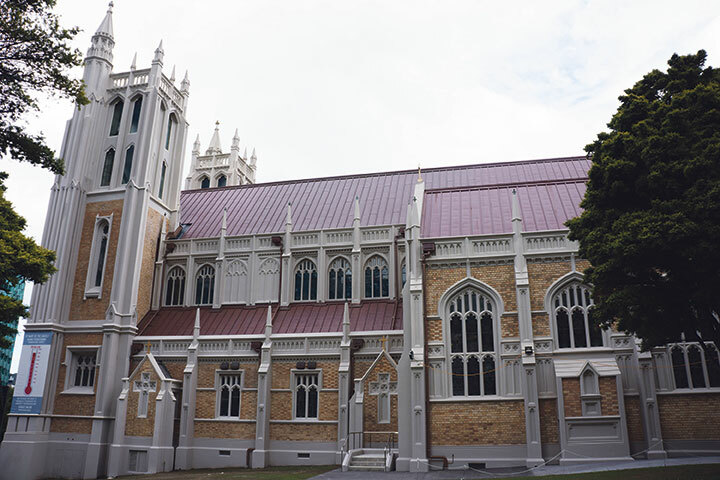 Following the Seddon earthquakes on 23 July 2013 this much-loved, inner-city church was closed for nearly four years for major seismic strengthening. 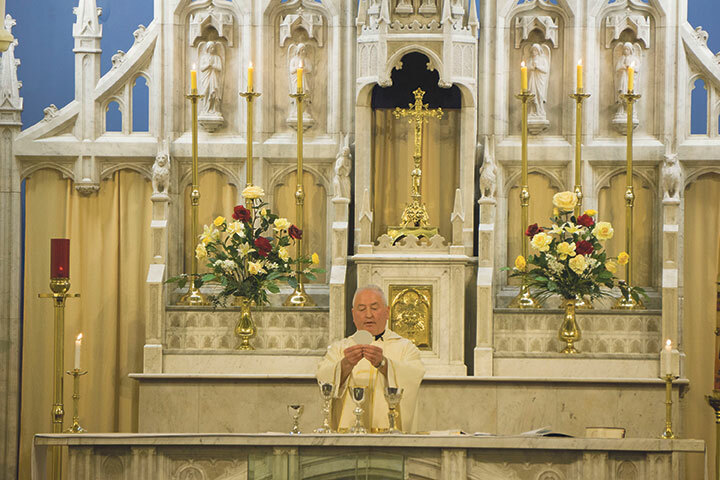 With much pride and pleasure, Parish Priest Fr Barry Scannell sm welcomed 200 guests, closely connected to the project, to the reopening of the church, re-consecrated and blessed by Cardinal John Dew. Concelebrating the Mass of the Lord’s Supper on Holy Thursday evening, from left are Fr Barry Scannell, Cardinal John Dew and Archbishop Martin Krebs, Apostolic Nuncio, with the support of priests from the Archdiocese. 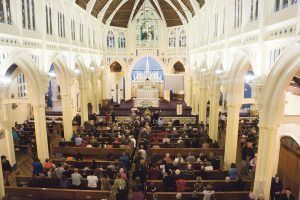 For nearly 100 years, St Mary of the Angels has served a community of parishioners from all walks of life and welcomed visitors. 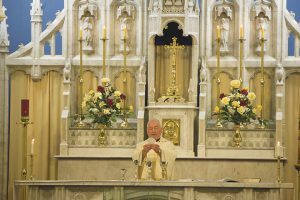 It has been a statement of faith and community for generations of Catholics in Wellington. 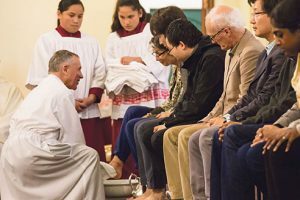 After almost four years, the newly strengthened church was reopened during Holy Week for the Easter Triduum with Cardinal John Dew reconsecrating and blessing the church at an official opening on Wednesday 12 April. On Holy Thursday the resurrected church was filled with parishioners and visitors joyful to return in prayer and reverence to this sacred place as Cardinal John celebrated the Mass of the Lord’s Supper supported by the priests of the Archdiocese and the choirs of St Mary of the Angels and Sacred Heart Cathedral. Good Friday services of the Stations of the Cross and The Passion of the Lord, Holy Saturday’s Easter Vigil Mass, and Easter Sunday Masses were attended by parishioners and visitors in their hundreds. The church had been closed for major seismic strengthening following the Seddon earthquakes on Sunday 23 July 2013. Two churches had previously stood on the site. Fr Jeremiah O’Reily ofm built the first church – a simple wooden chapel, which was blessed by Bishop Pompallier in 1843. A larger timber church was built in 1874 but was badly damaged by fire in 1918. 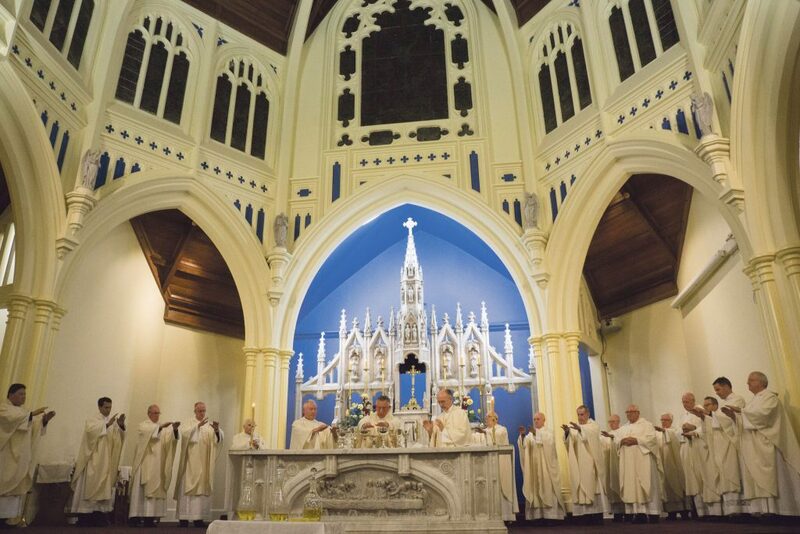 On 26 March 1922, after major fundraising efforts by parish priest Fr Stanislaus Mahony sm and parishioners, the architecturally beautiful church of today was blessed and opened by Archbishop Redwood sm. This category 1-heritage building was designed by Frederick de Jersey Clere, a noted ecclesiastical architect in the first half of the 20th century. Considered to be the world’s first reinforced concrete gothic structure, St Mary of the Angels is known for its tranquility and ambience. Its world-class acoustics have made it a respected venue for many civic events and musical performances. The Seddon earthquakes, magnitude 5.8 during the 7am Mass and 6.5 during the 5pm Mass, didn’t alter the church. 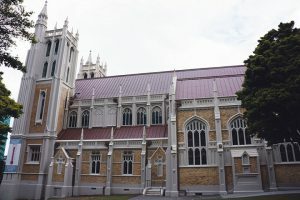 However, the building had previously been deemed earthquake prone by the Wellington City Council at less than 33 per cent of the New Building Standard (NBS) . 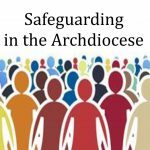 Parish priest Fr Barry Scannell sm was faced with the courageous decision of closing the church in the interests of safety while its structure was assessed. Engineering consultants concluded the building met only 15 to 20 per cent of NBS. In mid-2014 a strengthening proposal was accepted that would retain the building’s integrity and strengthen it as closely as possible to 100 per cent of NBS. The parish was presented with two major challenges: raising the funds to ensure the work could be undertaken; and maintaining the integrity of the heritage building and retaining its unique ambience. 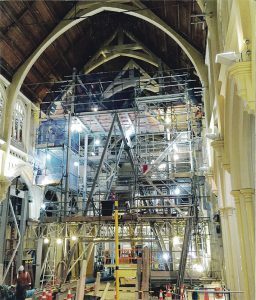 ‘I was not so concerned with the construction-side of the strengthening as I knew I had top consultants and engineers and the only construction company in the country capable of completing the job at a fixed price and retaining the integrity of this historic building,’ said Fr Scannell. The construction company was LT McGuiness – a third-generation Wellington company. Managing director Brian McGuiness was attending Mass at St Mary of the Angels during the second Seddon earthquake. 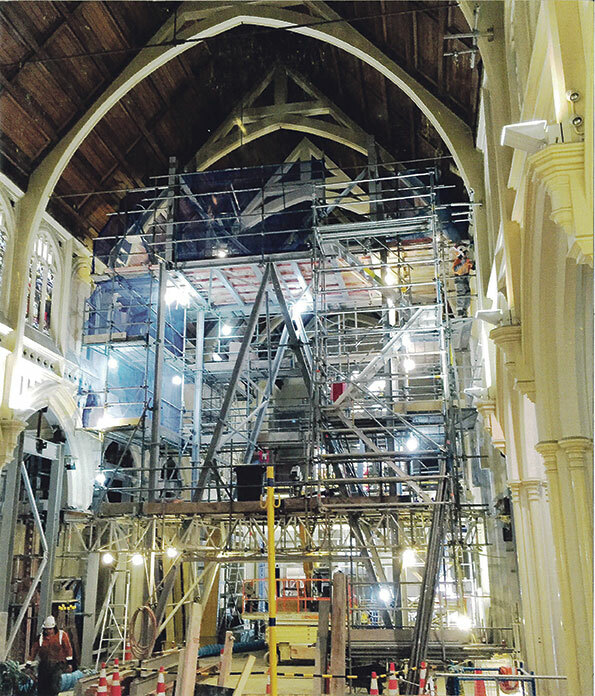 Fr Scannell said, if the strengthening work had not been undertaken, St Mary’s would have gone the same way as Christchurch Cathedral – ‘damaged and abandoned’. Fr Scannell took on the role of fundraising to ensure every dollar raised would be used for strengthening the church. A major fundraising programme was launched on 7 August 2015 at a reception at Parliament hosted by the Hon Christopher Finlayson – a parishioner at St Mary of the Angels. 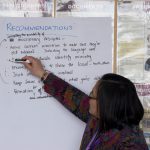 Almost 300 people attended and were presented with the church-strengthening plans at an estimated cost of $9.5 million. The initial aim, to raise one third ($3.2 million) so work could begin on Stage 1, was reached in early 2015 and work began on 17 March 2015 – St Patrick’s Day. Wellington City Council recognised the project’s significance with funding of $530,000 for preliminary seismic assessments, structural work and reinstatement of the famed Maxwell Fernie organ and the cork flooring, an integral part of the church’s acoustic resonance. Lotteries New Zealand contributed $1.7 million and there have been significant contributions from charitable foundations such as the Hugh Green Charitable Trust, the Nikau Foundation, the Society of Mary (Marists), family trusts, individual donors and parishioners. 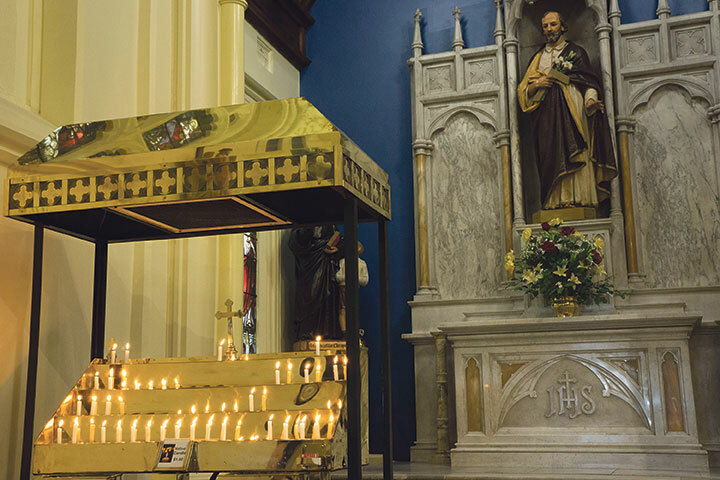 Throughout the process, Fr Scannell and his pastoral team continued to lead the congregation and minister the needs of the parishioners and wider community. Other inner city churches, notably St John’s in-the-City Presbyterian Church and its minister Allister Lane, provided alternative accommodation for the congregation and the choir. At the blessing and rededication last month Fr Scannell acknowledged the many who have contributed to the preservation of the Church and the seismic strengthening fund, including over 800 individuals, numerous families and family trusts, the major donors and the patrons including Sir David Carruthers, Rt Hon Jim Bolger, Sir Anand Satyanand, the late Sir John Todd, and Dame Beverly Wakeham. Cardinal John thanked Fr Scannell for his courage and energy in leading the fund-raising campaign. He also thanked the many other people who have worked hard to bring the project to a reality. Cardinal John said, ‘We need our memorials, our holy places, our churches. We need this church, not to escape life but to memorialise it because here we have known life in a fashion that is worth living, that we have been ourselves here, have learnt to love others here, and have found the Holy Spirit at the same time. 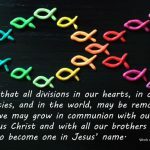 ‘This work was done so that we, who come to sacred liturgies, and those who wander in off the street looking for a moment of peace and quiet – may find the Holy Spirit; and so that we can come here and be ourselves, and learn to be comfortable with who we are in the presence of God. ‘Hopefully this church is now ready for another 100 years of life,’ says Brian McGuinness. You can donate online www.smoa.org.nz to help St Mary of the Angels reach its full fund raising target of $10 million to complete all the necessary work for the church. New ground beam foundations running the length of the church. There was 460 cubic metres (approximately 100 truckloads) of concrete poured into the 140 tonnes of reinforcing steel. 47 ground anchors tie the nave’s new foundations to the bedrock, with another 32 in new tower foundations, to provide resistance against uplift during an earthquake, in addition to their role as traditional piles. Most of the building’s ornate columns have been replaced, and recast to ensure they are exact replicas, except made with stronger reinforced concrete and tied into the new ground beams. The main portals, running from the columns to the building’s roof, have been replaced and strengthened with new concrete sections, hidden steel supports, and fibre wrap. New shear walls provide significant longitudinal strength. New steel cross-bracing above the existing ceiling lining. New gutters behind the parapets. New foundations under the two towers at the northern end. The old copper and slate roof has been replaced with a new copper roof (1200m2) and gutters. The side chapels’ walls have been sprayed with 370m2 of concrete. 50 tonnes of new structural steel beams and braces, all hidden. 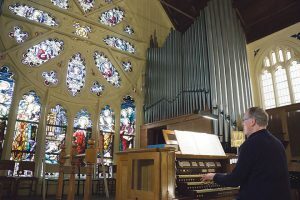 Reinstatement of the ‘Maxwell Fernie’ organ. 100 new LED lights installed.